The distribution of plasmonic field is shown in yellow color. 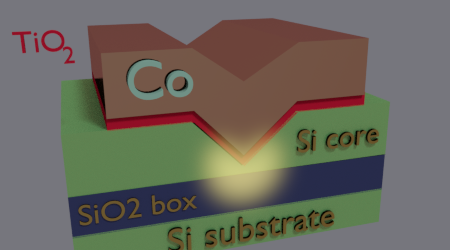 There is a substantial scattering loss at the metallic edges of a plasmonic structure. To avoid this huge loss, the plasmon is confined at the center of the metallic structure. It push out the field of the plasmon from the edges of the metal and plasmonic loss is reduced. The bridge or grove or wedge is used for the in-plane confinement (See here). 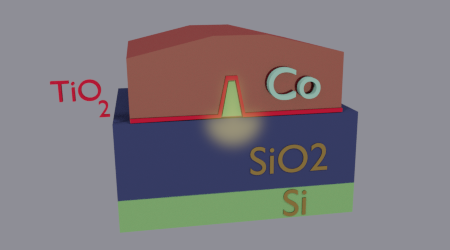 Fig.2 Optical absorption of Au:SiO2 single-surface, single dielectric plasmons as function of width of metal stripe. Black line symmetric mode. Red line is asymmetric mode. 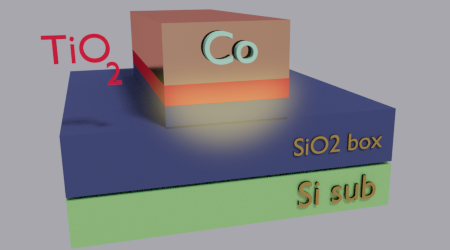 The optical loss for plasmons in Au:SiO2 film is 45 dB/mm. 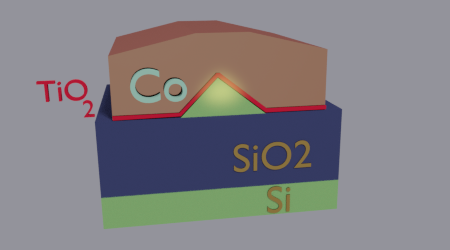 It is smaller than in the Au:SiO2 stripe. Fig.3 Animated pictures. Distribution of optical field inside Au/SiO2 plasmonic waveguide for symmetric mode (left) and asymmetric mode (right), Animated parameter is waveguide width. Sizes are in um. Wavelength 1550 nm. Fig.4 (center, animated picture) Distribution of optical field in Co-SiO2-AlGaAs-GaAs plasmonic waveguide (800 nm). Animated parameter is thickness of SiO2 layer (BetweenThickness). (right) Optical loss of surface plasmons as function of SiO2 thickness. Fig.5 (center, animated picture) Distribution of optical field (center) Co-SiO2-S plasmonic waveguide (1550 nm). Animated parameter is thickness of SiO2 layer (BetweenThickness). (right) Optical loss calculated for different depth of calculation window. The calculated optical loss might be large than real value due to limitations of the calculation method (The dependence of calculated optical loss on the sizes of calculation window indicates the limitations of the calculation method). It is still a challenging task for me to calculate correctly the parameters of surface plasmons in a stripe-metal waveguide near cutoff by FEM method.